PayPal is one of the most widely used payment gateway services in the internet and e commerce market today. With over a billion dynamic users, it has a distinct API called PayPal IPN. Creating a direct paypal checkout for your website. Processing through PayPal IPN which is the callback method that conveys the payment particulars to you. This method will be used for high quantity online retailers who wants to save their customer information on their own website instead of storing it in PayPal. In today’s world, the consumers use both their credit cards and debit cards for making payments, which can be large or small. The payment gateways make credit card transactions even more efficient . Batch upload features to submit multiple transactions in a single file and the ability to verify accounts quickly and securely are becoming faster and easier these days. PayPal is a very trustable online payment gateway which we can use in our web/mobile applications. In todays world PayPal perks includes accepting checks through a smartphone’s camera, a card swiper, and allowing customers to make a purchase without leaving your site. 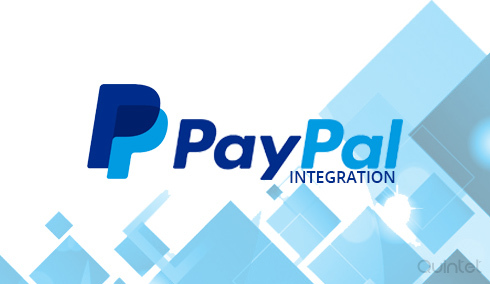 Looking for PayPal integration services, Quintet Solutions offers effective online payment gateway integration services to integrate your website or shopping cart with PayPal. Our skilled programmers have combined and integrated numerous websites with paypal and made the payment experience smooth and customer friendly. PayPal offers several types of payment choices for various types for your web/mobile applications and our programmers at Quintet have good experience in integrating them to the clients apps or websites. We can do the following by integrating paypal on your apps. The express checkout is the most popular payment method and it allows us to receive payments without having a merchant account and without having to meet special requirements other than verifying your account . It is as simple as that. Express Checkout is a process that is done on PayPal’s platform and cannot be fully integrated into your website experience. The primary advantage is using the Adaptive Payment integration, enabling easy break up of payments up to 6 different receivers at the same time. It can be set to receive specific percentage of amount to each receiver in this gateway settings. It can also be determined whether to make chained or parallel payments. The Direct Payment method allows you to receive credit-card payments directly through an API call. This enables hosting the entire payment process on any website, there by giving a complete shopping experience for customers. The Direct Payment method has several variations that enable you to authorize a payment and complete it at a later date. Recurring payment option comes into use when there is recurring subscription for a particular service or product. This will help in maintaining long term businesses. An easy checkout option from a customized paypal page, that will appear to be the part of the website with the logos as well, can be achieved by using Paypal integration. Paypal Integration allows customers to choose the size and colour of the products by using option fields. Automatically return customers to your website after they have completed their payment by using the Auto Return feature. Use the Shipping Calculator to let PayPal calculate your shipping costs for all of your transactions. PayPal helps you easily and automatically calculate sales tax with the tax calculator. PayPal maintains detailed transaction records on the website which will certainly help you to analyse the sales and manage your stock accordingly. Your payments are always safe and secure with Paypal. Authorize.net is one of the most widely used payment solutions. Authorize.net supports secure credit card payments through websites and mobile devices using the Authorize.Net payment gateway. At Quintet we provide features that can help you manage and review your transactions, report downloading, etc. Bitcoin are digital coins you can send via internet. It uses peer-to-peer technology to operate with no central authority. Quintet always follows the emerging technologies and our team will help you to set up a Merchant account for Bitcoin transactions which will help you increase sales. Stripe's API handles everything from online payment, storing cards, subscriptions and direct payouts to your bank account. Stripe operates in the background allowing online retailers to customize the entire shopping experience for customers. We can help you integrate Stripe.